Thanks to @totalpartykillr for this art piece! We know, we know, they’re not monsters! They are super adorable, well-cared for, (mostly) well-trained creatures raised for the express purpose of providing companionship for responsible individuals who are capable of offering the love, care, oversight, shelter, and dietary needs each furry or feathered friend requires. Naturally, the pets were bought by The Mighty Nein instead. Weasels in general are skilled at staying out of sight and are a decent pet for individuals requiring a mammalian infiltrator. They are fairly perceptive to their surroundings (advantage if using hearing or smell), have a +5 stealth modifier, and are relatively difficult for the average guard to hit if attacked, compared to most common beasts. (We image the crimson variety is all of that, but red.) With that in mind, the crimson weasel is still just a weasel, and any damage done to it could be the end of the rodent. In terms of personality and training, we recommend reading Your Crimson Weasel and You to prepare for any sly and/or reckless hijinks that are common to the breed. Thanks to @HashtagArtastic for this art piece! 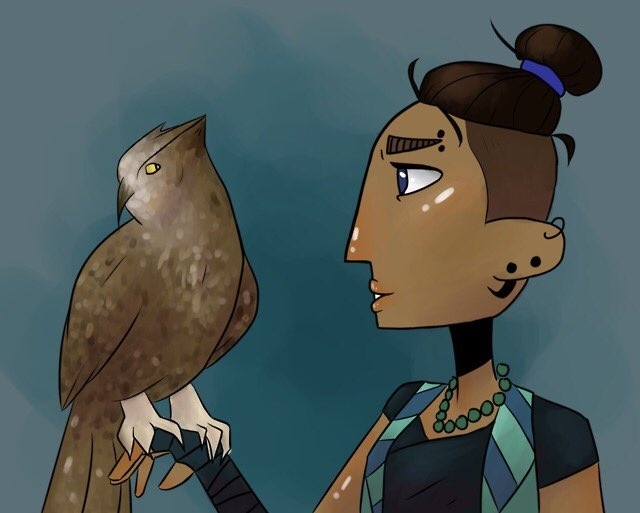 Technically, Beau's new companion isn't a Great Horned, but the stats and temperament are about the same (and probably just a little bit more abrasive). Provided its mood improves at night and it is ever put to utilitarian purposes, it is fairly perceptive to its surroundings (advantage if using hearing or sight), has a +3 stealth modifier, and can fly past hostiles without provoking attacks of opportunity. Like the weasel, however, if it’s ever killed, there is no coming back. Thanks to @DemeruArt for this art piece! The blink dog in rules-as-written has an intelligence of 10; just for context, that’s higher than Caduceus. It’s also got a wisdom of 13, which is higher than Fjord, Nott, and Yasha. It’s got a strength of 12, which is higher than Caleb, Nott, Beau, Fjord, and Caduceus. When fully grown, Nugget will be the third-strongest member of the Mighty Nein. Again assuming rules-as-written, Nugget is also fluent in Sylvan (but can’t speak it). Frumpkin’s no longer the only fey creature in the mix! A fully grown blink dog only has a challenge rating of ¼ (meaning it would approximately be considered a fair challenge for a single level one party member) and all of 22 HP. Worried about stealth rolls? Blink dogs are proficient and have a +5 to stealth. As an adult, a blink dog can teleport up to 40 ft. (within eyeshot) in a single round as an action. On its next turn, there’s a 50% chance it will regain this ability. Blink puppies are most likely to return to their family after blinking if they have imprinted on a particular owner; if not, they may run away for good. Feeding a blink puppy primarily meats results in a more aggressive blink dog; more veggies means a more docile dog. Baths are tricky because they tend to blink away instinctively. An (often overpriced at point of sale) item called a Temporal Leash can potentially keep a blink dog from running away during the training process. Thanks to captainceranna for this art piece! Twin tiger cubs: see Monster Manual p339 for more details about the adult versions. Jemila the elderly baboon: see Monster Manual p318. Tropical Birds: While there’s understandably no direct reference to any of these (real world or otherwise), we would recommend reskinning the raven for your home-game purposes; see Monster Manual p335. Peacock: See Dire Chicken (Monster Manual entry not found).